Michael Crow, Arizona State University’s president, heard this lament and suggested to Stephenson that perhaps the problem began with Stephenson himself, and other sci-fi writers like him who weren’t thinking big enough in their ideas. Thus, Ed Finn and his Center for Science and Imagination at ASU stepped in, connecting some serious scientists with those great masters of imagination, science fiction authors. The culmination of these connections are boggling, vivid, and seriously delightful: a structurally sound twenty-kilometer-high steel tower (that would be really high, for those lacking perspective); cities that function like ecosystems, either through technology built to act as biology or through biological infrastructures; a world where machines have been entirely replaced with living matter; or a psychedelic revolution where we’re tripping out on quantum mechanics rather than any sort of drug. 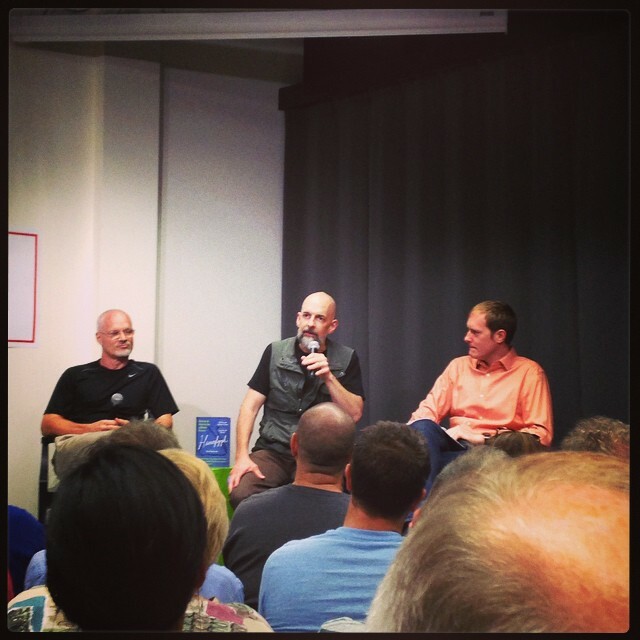 I had the opportunity to attend a Hieroglyph release event with many of the authors, most notably Neal Stephenson, and both of the editors, at Kepler’s Books in Menlo Park on September 10th. No better place to talk about science and imagination than in the heart of so much innovation, Silicon Valley, right? 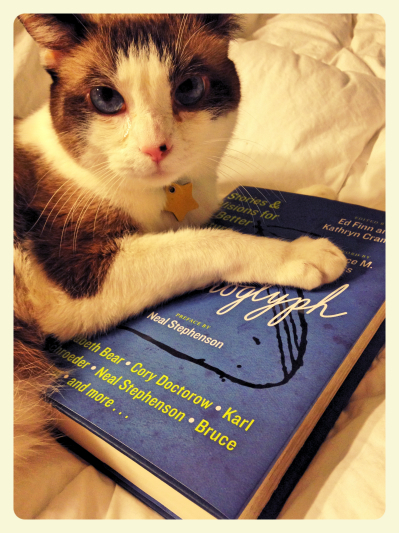 After a quick introduction by Finn, who also edited the book, the first panel featured Stephenson and Keith Hjelmstad. Hjelmstad is a professor of structural engineering at ASU who worked with Stephenson on his idea for the book, the Tall Tower. The idea originally came from an old paper by Jeff Landis, Stephenson said, but he realized quite quickly he needed professional help. He was doing fine until he took wind into account. “99.9% of the problem is wind,” he said, with a very, very high building. Hjelmstad said the “desire to make it real” drew him to the project–he even had a graduate student e-mail him about a design detail that morning. As the world of engineering is often bogged down with many codes and lawyers, which can kill creativity and innovation, this project offered something different. Stephenson and Hjelmstad eventually came up with something that “looks like a tower, but flies like a kite,” as it was necessary to harness the wind for stability. This was sort of a new way of looking at a building–an organic idea. Newitz, Anders, Rucker, and Cramer. 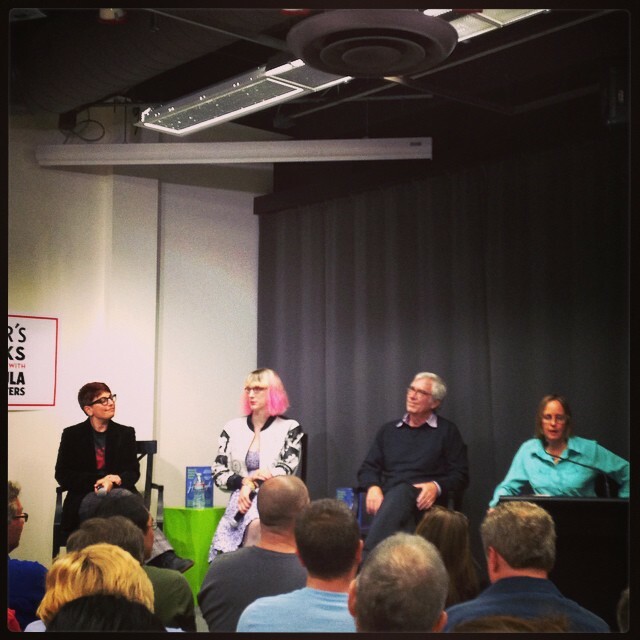 The second panel featured Hieroglyph‘s second editor, Kathyrn Cramer, and three contributors: Annalee Newitz of io9 fame; Rudy Rucker, a founder of cyberpunk; and the award-winning Charlie Jane Anders. 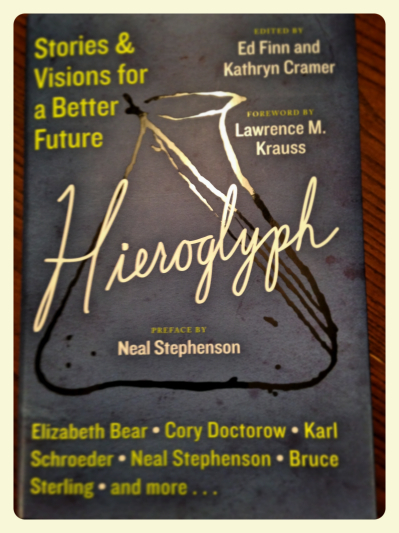 Newitz said at one point that the most audacious thing about Hieroglyph is that these stories focus on humanity surviving. I think this is a huge, interesting point, and I tend to agree. There is quite a bit of fatalistic, dystopian fare out there right now. Do we really think we’re that bad? I hadn’t ever heard of Charlie Jane Anders, but her commentary made me definitely want to check out her work. Also, Rudy Rucker seemed wildly wise, like some sort of buddha in writer’s garb, and I’m excited to read his stuff as well. The conversation is ongoing, as Project Hieroglyph itself is designed to be an interactive and open experience–don’t let the book’s pages, with all their permanence, fool you. You can contribute your ideas, and perhaps change the world, or just start changing the world’s story.